Fall is right around the corner for most people, but since I live in Texas fall will not show up until beginning of November. We Texans love to pretend to have a fall so pumpkins are outside the stores and people put their fall wreaths on their front doors. Every year I buy about 4 big pumpkins and roast them in my oven, puree the meat and freeze it to use all year long. Fresh pumpkin is far superior to the canned variety and is much cheaper too. Try it out! I have been cleaning out my freezer to make room for more pumpkin and a couple of turkeys at thanksgiving. 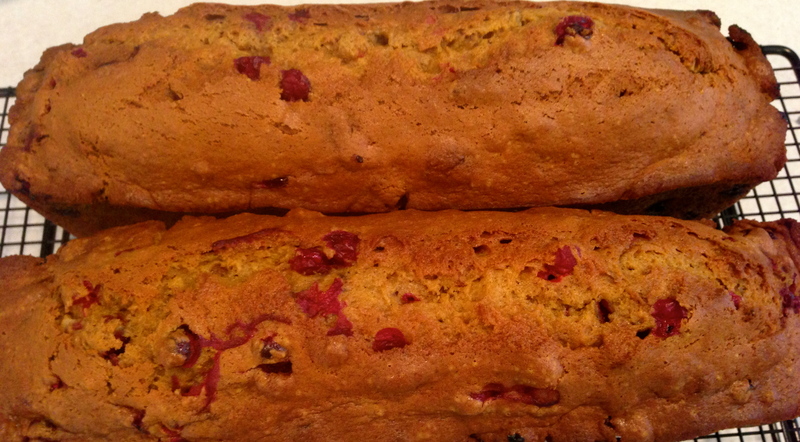 I found one small container of pumpkin and a bag of cranberries left from last year and decided that I would make a pumpkin cranberry bread. My house smelled amazing, I almost turned on Christmas to get the full effect. Here is the recipe, its easy and it is an instant fall starter. Preheat your oven to 350 and get out two loaf pans. In a large mixing bowl combine the flour, spices, baking soda and salt and whisk them all together. In another mixing bowl combine the pumpkin, eggs, oil and vanilla. Pour the pumpkin mixture into the flour mixture and stir together until its all combines. Stir in the the cranberries and walnuts. The batter will be thick! 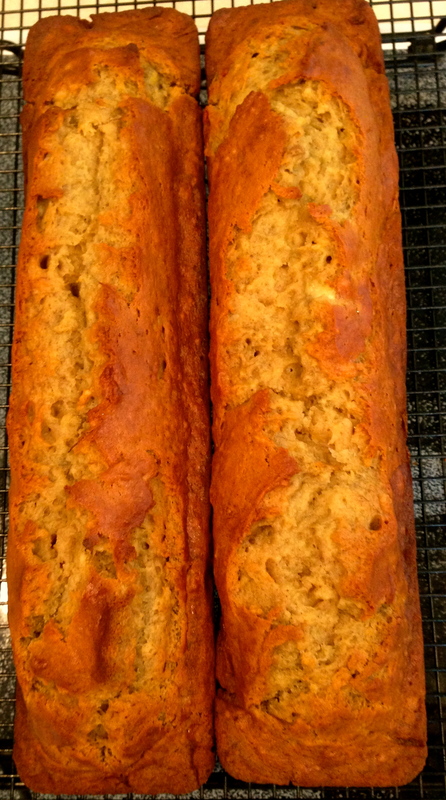 Generously coat your loaf pans with nonstick cooking spray and pour in the batter. Bake for 45 min-hour. When a toothpick inserted into the middle comes out clean its done. Cool the bread in the pan on a wire rack for about 30 min and then dump it out onto the rack. Serve with cinnamon cream cheese, or just eat it plain. Its truly delicious. Enjoy!